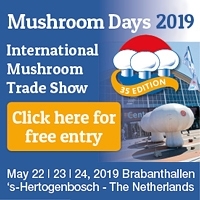 From 22th to 24rt May 2019 the Mushroom Days will be organized for the 35th edition in de Brabanthallen, 's-Hertogenbosch. This event is an excellent opportunity for the mushroom industry to meet each other, exchange experiences and gain knowledge of the latest developments. During the Mushroom Days 2016, it had grown again in number of exhibitors as well as in the number of visitors. During the Mushroom Days, 87 exhibitors presented their products and / or services to the visitors. There were 26 international exhibitors. A record number of 2839 visitors from 78 countries visited this edition of the Mushroom Days. On the Wednesday, May 22 from 5:00 pm to 9:00 pm the Welcome Event will be organized again. During this evening, the 'Ambassador of the Mushroom Industry Award' will also be presented for the third time. The evening will be concluded with a delicious buffet. Visitors, exhibitors and their partners were all welcome and participation was free.